Railpictures.ca - Steve Bradley Photo: Some nights you never know what’s around the next corner and that sure proved correct as we approached Brookmere BC in the middle of the night Oct. 14, 1981. ( I was working as a Trainman out of Revelstoke BC, and had been sent to Penticton to work the Spences Bridge freight for two trips account their regular Trainman booking off. It was a line I had never been on before. ) I thought I was seeing things ! After all, it was 1981, steam had been gone for decades, and there ahead was a water tower complete with not one, but two spouts. Hogger Palmer Sather chuckled and said don’t worry, we’ll make a stop eastbound so you can get some pictures in daylight. True to his word, on my second KVR trip, Oct 16, we ground to a halt so I could capture this unique tank which served both the CPR and Great Northern at this former Division Point. Oh if that tank could talk. | Railpictures.ca – Canadian Railway Photography – photographie ferroviaire Canadienne. Caption: Some nights you never know what's around the next corner and that sure proved correct as we approached Brookmere BC in the middle of the night Oct. 14, 1981. 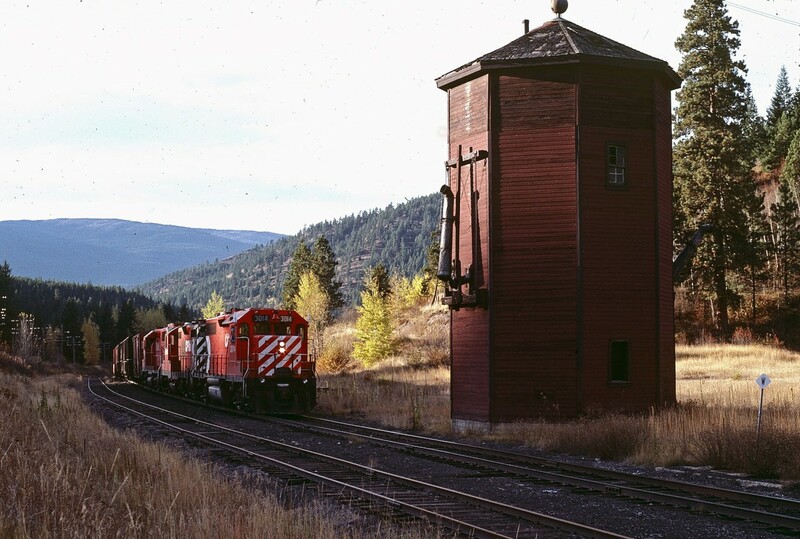 ( I was working as a Trainman out of Revelstoke BC, and had been sent to Penticton to work the Spences Bridge freight for two trips account their regular Trainman booking off. It was a line I had never been on before. ) I thought I was seeing things ! After all, it was 1981, steam had been gone for decades, and there ahead was a water tower complete with not one, but two spouts. Hogger Palmer Sather chuckled and said don't worry, we'll make a stop eastbound so you can get some pictures in daylight. True to his word, on my second KVR trip, Oct 16, we ground to a halt so I could capture this unique tank which served both the CPR and Great Northern at this former Division Point. Oh if that tank could talk. I think I could live there! Yes it does, and once a year they have a small festival honouring the towns former railway history. Does this artifact remain today? What a beautiful piece of architecture!